This picture shows Sundream at the Northsea Channel near Buitenhuizen in the summer of 2004. Of course she was built as the first ship within the fleet of Royal Caribbean cruise Line as Song Of Norway. Song of Norway, the first ship of a new generation of cruiseships, was launched at the 7th of december 1969 from the Wätrsilä Yards in Helsinki, Finland. She was the first of a series of three ships for a new venture called Royal Caribbean Cruise Line, but in fact owned by one of the Norwegian shipping firms that formed RCCL, Sigurd Skaugen. This company really wanted to break out of the traditional cruise-industry, offering a well balanced product, very modern in appearance. Of course they just followed Norwegian Cruise Line, the pioneer, but they had learned from their earlier competitior about what could be done better. The first thing they did, was order real cruiseliners instead of ferry-like ships and on these terms, they were groundbreaking. What they did take over from NCL was the team of designers, so they were in some way impressed by the work that they had done on these ferry-like ships. Designer was Knut E. Hanson from their homeland Norway, but an extra touch was given to the Royal Caribbean ships by architect Gier Grung, also a Norwegian. He was mainly responsible for a distinctive feauture aboard the ships, a lounge wrapped around the funnel with magnificent seaviews. This became a trademark for the company, called the Viking Crown Lounge and it made these ships immidiately recognizable within the pioneering cruisefleet from Miami. Next to this innovative lounge, large, rounded lido decks were added, sheltered by glass screens that protected passengers from the winds at sea and the ships showed also sharply raked clipper bows and large foredecks. They were really the first true modernly designed cruiseships, still with several features that had made the fore-running generation of liner/cruiseships popular. The interiours of the ship, mostly designed by Mogans Hammer from Norway (yes, who also did the interiours for the NCL ships) were inspired by famous musicals. A change in fashion. On Song Of Norway it was possible to dine in the 'King And I' restaurant, which was decorated with oriental murals and ornate lantarns, giving the passengers hints to the riches of Siam. In earlier ships, mostly within the linertrades, the themes mostly were national pride for the national lines, or other themes like Italian Renaissance, Versailles, English coutryhouses or Art Deco. Song Of Norway was the first ship that was inspired by Broadway and Hollywood, places that became much more popular by the general travelling public where RCCL aimed for. This radical new ship, which it was, was named by Magnhild Borten, the wife of Per Borten, at that time the Prime Minister of Norway. So yes, also Royal Caribbean started out with some national pride from Norway and even presidential accountance. Her first cruise started in Miami at the 7th of november 1970 and took her, of course, into the sunny Caribbean. She and her sisters became instant popular ships, the new market ideas presented by RCCL attracted the people they wanted to attract and also in large numbers. So large, that the ships became too small and eight years after her launch, the ship was lenghtened and rebuilt, just like one of her sisters, Nordic Prince. When built, Song Of Norway measured 18.416 tons and was 168,30 meters long. Some 724 passengers could be carried and with this, also nowadays it seems very tiny, was the standard for modern cruiseships built around 1970. After her rebuilding had finished, at the 26th of november 1978, she emerged as a ship of 194,32 meters long and her tonnage had grown to 23.005. Of course this was done to increase passenger capacity, so now there was room aboard for 1138 of those. It was by no means the first lenghtening of a passengership, this was done already long before the 1970's, but it was the largest lenghtening since then as most lenghtenings untill then were just a few meters on smaller ships, mostly ferries. After her lenghtening, she again was placed in her Caribbean habitat and just a few years later, the former ferries of NCL were joined by the first Caribbean megaliner Norway, and her introduction also inspired RCCL to grow even more is size. 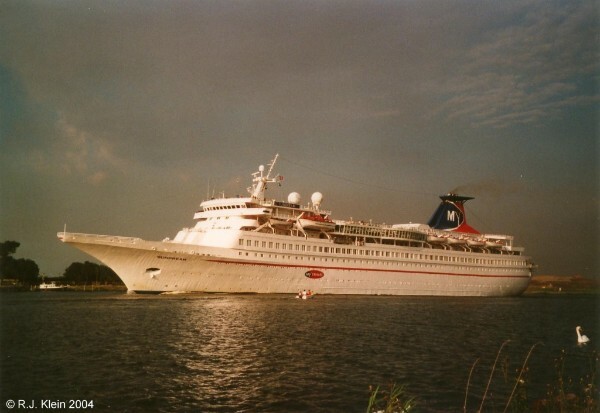 Song Of Norway was sold to the British company My Travel, sailing under the banner of Airtours Sun Cruises, and renamed Sundream in 1996. Her first cruise under her new name took her to the Mediterranean in may 1997. The Med was the most important region for Sun Cruises, because My Travel had their base in Palma de Mallorca. The company was already a big player there and so it was easy to use that as a basis for the new cruise-operation. Becasue My Travel was new to cruising, they asked RCCL to manage the ship so that this would run smoothlty. It worked, as the ship was still popular in her new role. Intention was to change the European cruise-industry in the same way as the American industry was changed with the introduction of these ships and My Travel bought more ships from RCCL as well as Norwegian Cruise Line that had pioneered Caribbean modern cruising. In 2003, Airtours ceased their cruise-operations because My Travel had run in financial difficulties, selling then ship to Louis Cruise Line. Louis chartered her out to the Israelian company Caspi Cruises under the name Dream Princess. In 2006, her name was changed to Dream because Princess Cruises was not really happy with her former name. She recieved her new name after she was briefly chartered as a faculcy of the Tulane University in New Orleans after the hurricane Katrina. In 2007, the ship was sold to the Clipper Goup and renamed Clipper Pearl. She was chartered to peaceboat in 2008 for a few months, before being named Clipper Pacific in august of that same year. One year later, she was sold to International Shipping Partners under again a new name, Festival. In november 2009 she was chartered to Quail Cruises as a excursionship under the new name of Ocean Pearl. At the end of 2013, after a brief period sailing as a gamblingship in Asia, the first of the ships that set sail for Royal Caribbean was sold for scrap, following a growing number of elderly ships that had formed the first 'new generation' of cruiseliners in the late 1960's and early 1970's.